Home / Lazada, Marketplace / How to Sync Your webShaper Store with Lazada? This option will allow you to sell your products through your webStore and Lazada marketplace! Please follow the step by step instructions. This feature is only available for webShaper sohoStore or bizStore users, who are also Lazada sellers. Not yet a Lazada Seller? Sign up one account here. It’s FREE! Before starting to map your product category, please make sure that your have fill all the required fields such as Short Description (make sure that it is bullet point style) and Long Description, Brands (if the brands in not available in Lazada, make sure to email first your own brand to partnersupport@lazada.com.my for register), and last but not least the Package Dimension. 1. Click on Products, select your item, and then go to Options. 2. 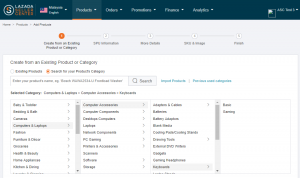 Click on Manage Products, then select Shipping. 3. Make sure you fill in the Package Dimension. These fields cannot be left as blank or else it won’t be sync to Lazada successfully. 1. First, we need to get the API from your Lazada seller account. Follow this tutorial to get yours. 3. Hover over the Lazada tab and choose Manage Settings. 5. Sync Inventory + Orders from Lazada: Inventory will be sync in between webShaper and Lazada, and each Lazada order details will be pulled back. 6. Difference in Price (Universal Price Changer): indicates the price you can add to your items; the number added can be a positive or negative integer. For example, if your product is selling at RM10, and you place a 5 in this field, your item will be sold at RM15 in Lazada. Consequently, if you place a -5 in this field, your item will be sold at RM5 in Lazada. This configuration applies to ALL the products you sync to Lazada. 7. Price Mode: Can either be set to Percentage (%) or Flat Price. 8. Tick “Are you a GST registered seller?“, if your product is registered under GST. If your product is not registered under GST, then do not tick the checkbox. 4. 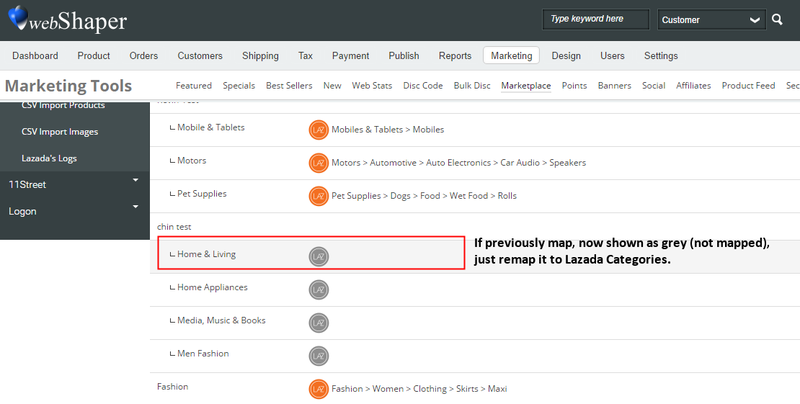 After that, you can start mapping your webShaper categories to the Lazada categories. i. Go to Marketing > Marketplace. ii. 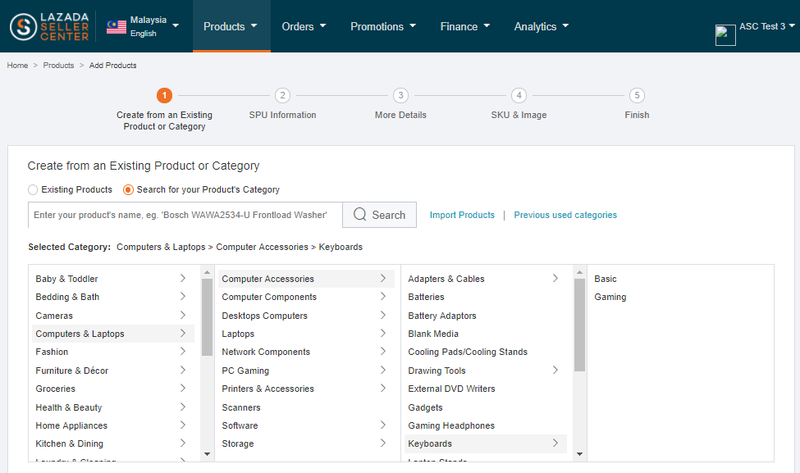 Under the Lazada tab on the left hand side, select Category Mapping. iii. Go to Category Mapping section, and click on “Update Lazada Categories”. This will fetch all Lazada’s latest categories. Please redo the mapping from webshaper categories to Lazada’s categories (for those unmapped categories). iv. Click on the Grey colored Lazada Icon, a window will appear prompting you to choose the Lazada categories. vi. After mapping, click on Save. If successful, a Category Saved message will appear and the Colored Lazada Icon will show. This step is designed to map webShaper Brands with Lazada Brands. 1. First, you must create your Brands before proceed with mapping webShaper brands with Lazada brands. If you have not create brands, please follow this tutorial to learn more. 2. Go to Marketing > Marketplace. 3. Under the Lazada tab on the left hand side, select Brands Mapping. 5. 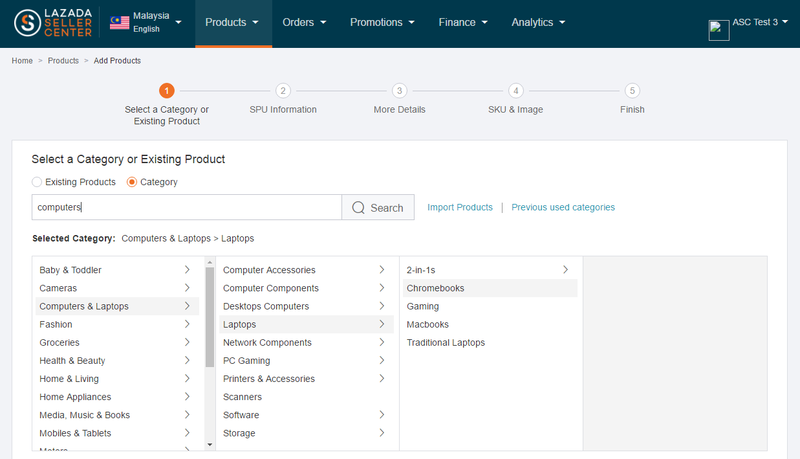 Then click on the Grey colored Lazada icon, a window will appear prompting you to search for your Lazada brands. 6. 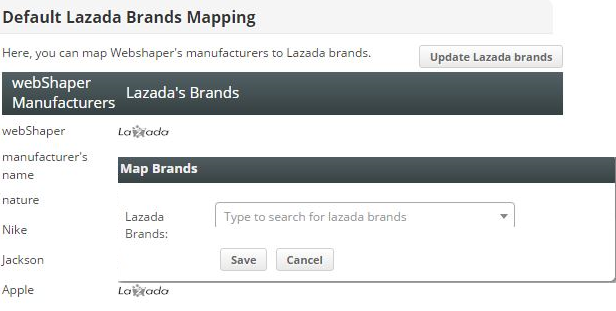 In Brands Mapping, you need to click the Lazada’s Brands button to make any changes towards Map Brands. 7. After you click the button, it will ask you to choose the Lazada brands according to your need. 8. As example you choose Nike in Lazada’s Brands, it will show you some other selection under the Nike’s name. 10. Remember to click Save when you’re done. *Note: If the your brand doesn’t exist in your Lazada seller centre, kindly refer to the tutorial link below how to create your own brand in to Lazada seller centre? *Note: To sync your products to Lazada, make sure your product that created is from an existing product or category inside Lazada. You can go to LazadaSellerCenter and be sure that your product falls under any selected category. i. After that, for the product option, you also have to make sure that it is fall under under any option listed inside Lazada, such as Color Family. If not, you cannot sync successfully to Lazada later on. ii. We have a new section called Options Mapping. This is to map webShaper’s Options and Attributes to Lazadas’ ones. a. You might have an option called “Pant Size” with the attributes “Size S, Size M, Size L, Size XL”. So you’ll need to map the option name to “Lazada Size”, and for the sizes to “Int:S”, “Int:M”, “Int:L”, “Int:XL”. P/S: Coming enhancement we will be able to provide a full list of options and attributes so you don’t have to type in manually. b. Eg, you choose Int:XL in the Specific Option Mapping. Then click Save. i. 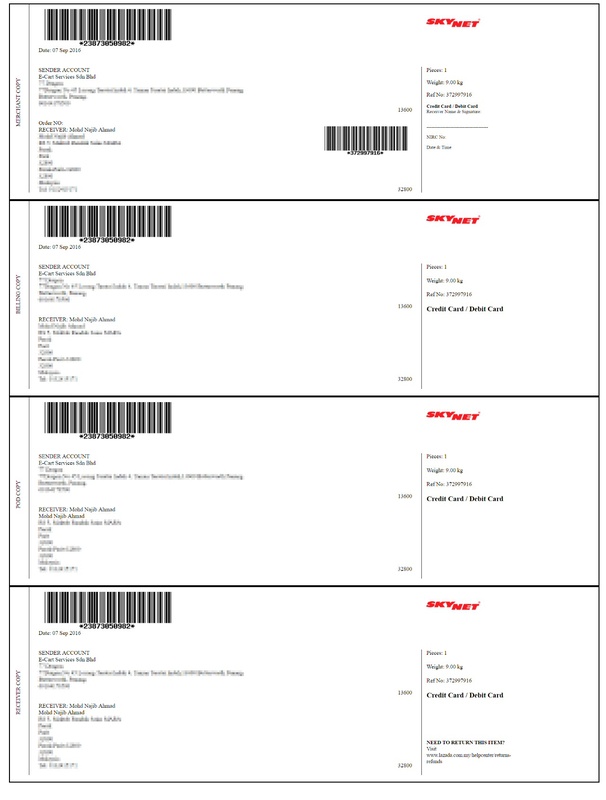 Warranty Type: Type of warranty from manufacturer and supplier. ii. Warranty Period: From 1 month to Lifetime warranty. iii. Discount Period: From 1 week to 1 year. 1. Every products listed in Lazada requires you to fill up the warranty details. In webShaper, you can create a master template for the warranty details and it will become the default values for every products that you select to sync to Lazada. 2. What if you want to change the warranty details for a specific products? You can easily do that later at Sync Product, where you can update new warranty details just for that product. 3. After you change the settings, click Save. 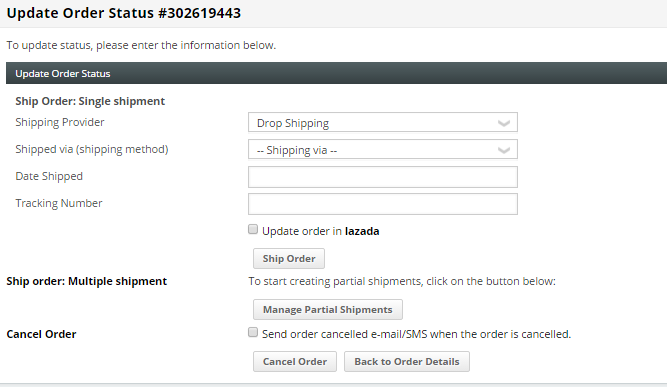 This step will allow you to sync your products with webShaper to Lazada. We empowered you to choose which products you want to Sync over! 1. Go to Marketing > Marketplace. 2. Under the Lazada tab select Sync Product Items. ii. All Products: Pushes all products in webShaper stores to Lazada. 4. If you Remove a product from this section, please note that the item will not be deleted from Lazada, it will only be un-synced from the product item; Re-adding the same item again might cause the item to be duplicated. iv. Mapped to: Shows where this product is mapped to (the Lazada category). Customize Name / Description: You can put different name and description for Lazada. 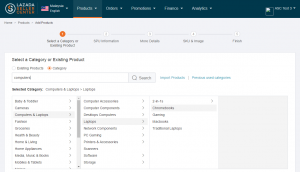 Price (bizStore only): You can set different pricing for Lazada on the Product / SKU level. If you apply discount. the price after discount will be shown in Lazada as Sale Price. Select Images: You can set different Product Images to Sync. Product Spec: Certain Lazada categories will requires different product information. webShaper will detect automatically and let you fill in the necessary column required. However, as of now, the value filled must be the same as Lazada’s value. Make sure to fill in all important/remark and you any other choose option. Push Images: Allows you to repush just images if the images sync was not successful initially. For single product in certain Lazada categories, it might need at least one option with one of the attribute. (For example; size, color_family, etc)Do not forget to mapped your product. For example; Computers & Laptops > Laptops > Chromebooks. Please go to Sync Product Items > Options > Product Option: Single.And click Add to add the option name and attribute. Eg: “color_family”, “Black”.P/S: Coming enhancement we will be able to provide a full list of options and attributes so you don’t have to type in manually. In Product Option: Single, in this case is Jersey, so you will have to choose Size selection. Regarding Is sample, if your product is not a sample, just choose No as a choose option. And then click Save. For Variations, most likely you’ll need to do the variations mapping in Step 4, in order to push products to Lazada. For example in the Fashion category, “SIZE” is mandatory. Therefore for products in Fashion, you’ll need to at least have the “SIZE” option for your products. Most Lazada categories will require mandatory Product Specification.To fill in the product specification, please go to Sync Product Items > Options > Product Spec.For the list of possible values, please refer to Lazada’s list in the Seller Center.P/S: Coming enhancement we will be able to provide a full list of product specification values so you don’t have to type in manually. All products requires the model to be filled in.This can be found under the Sync Product Items > Options > Product Spec, with the field “MODEL”.After you have done file up all the specification that you want, click Save.By default, webShaper will push the product name, if this isn’t filled in. Once an order is received from Lazada, the order will be stated as Processed, and stocks will be deducted from webShaper and gets updated in Lazada too. 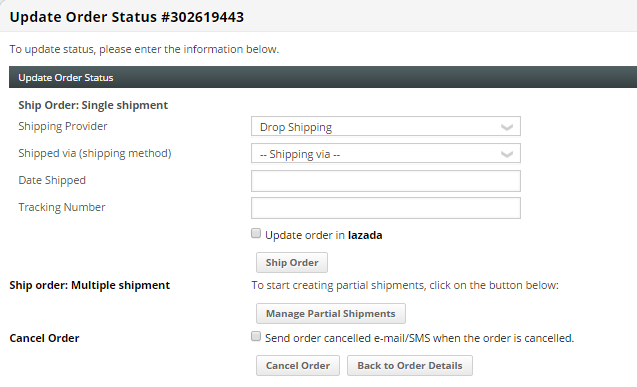 Once the order is being processed, you can proceed to make shipping changes from the webShaper control panel. From Pending to Ready To Ship. From Ready To Ship to Shipped. 5. 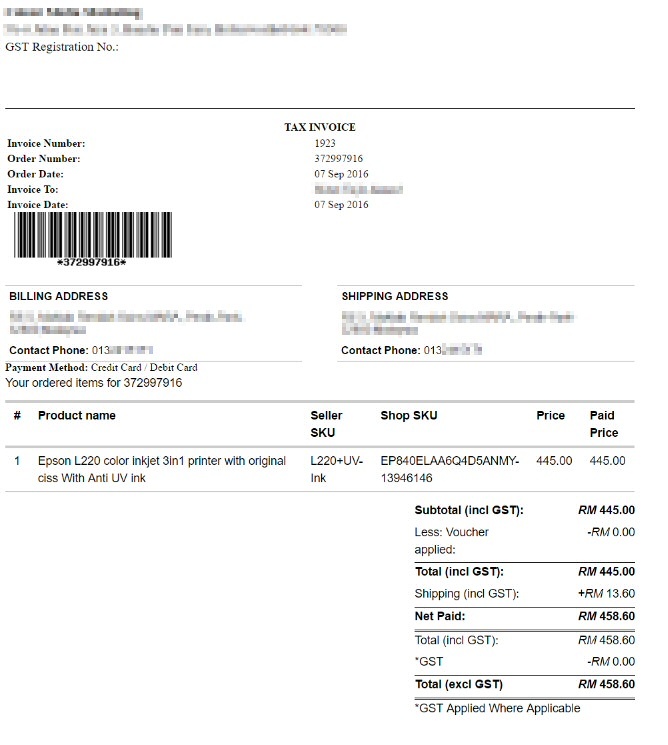 You can also Get Lazada Documents, mainly Invoice and also Shipping Labels from Lazada, which you can print within webShaper. i. Invoice – 1 copy. *P/S: Please ignore Shipping Parcel, Carrier Manifest and Serial Number as not applicable for time being. i. Lazada: Update Order’s to ready_to_ship. Fill in all the details. ii. Then select Lazada: Update Order’s to Shipped. Fill in all the details. iii. Once these steps are completed, an email notification from Lazada will be sent to your customers. Lazada Order Pending = webShaper Order Processed. Lazada Order Ready to Ship = webShaper Order Processed. Lazada Order Shipped = webShaper Order Shipped. Lazada Order Delivered = webShaper Order Shipped. Lazada Order Returned = webShaper Order Cancelled. Lazada Order Failed = webShaper Order Cancelled. Lazada Order Cancelled = webShaper Order Cancelled. 2. Under the Lazada tab select Lazada’s Logs. 2. A red flag means something has gone wrong during the Sync. Click on it to see the error message from Lazada. Resolve it or contact our friendly customer service at support@webshaper.com. For any issues that relates to Lazada, you can contact them here. 4. 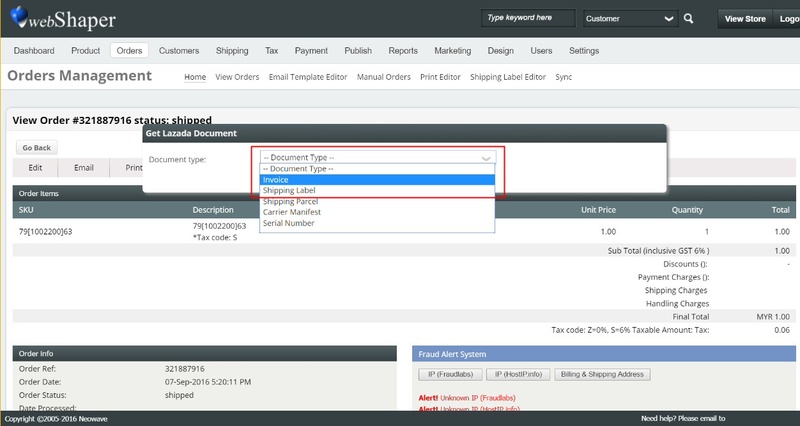 Subsequent changes to product information, you will have to select the product, click on re-sync to be manually pushed over. For more information on how to solve Lazada sync error, you may refer to this link here.